Jorgensen Conveyors has debuted its exclusive heavy duty 4" pitch hinged steel conveyor belt featuring a unique "pork chop-shaped" side wing chain construction for a flush, jam-resistant conveyor belt to meet demanding metal parts and scrap handling applications. 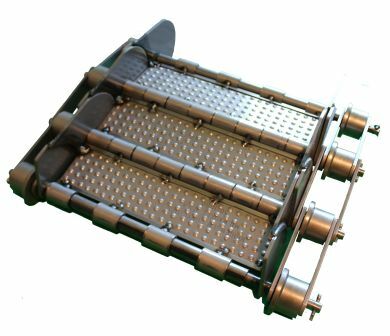 This conveyor belt construction has been developed with a specific focus to the demands of a wide range of parts and scrap conveying needs in metal working manufacturing operations. The innovative side chain construction includes a "pork chop shaped" side wing made with special ¼" thick "Exten Steel" (higher tensile strength) and welded together with close tolerances to form a tight and gap-free chain carrying side wall. The primary focus of this design is to handle heavy loads of scrap or parts of varying shapes and sizes, and to minimize any material getting lodged, hung up or jamming on the conveyor belt. The result is an effective conveyor discharge of the material and maximum conveyor uptime performance. Jorgensen recently won an order for a large 9 conveyor system at a tier one automotive supplier metal stamping operation which employed this new 4" pitch hinged steel belt. This system will be installed to move large volumes of thin-gaged stamping scrap through a brand new manufacturing plant.